Each LP includes a double sided 11×11 cardstock insert with lyrics and photos. 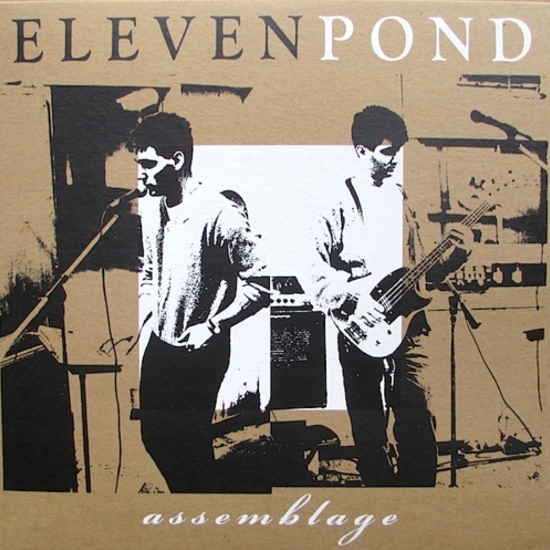 This is the long lost sophomore album by Eleven Pond. The band formed during the mid-80s in Rochester, NY, while attending art school, and were brought together by their shared love of 4AD and Factory Records. They released their debut LP “Bas Relief” in 1986, which was our first re-issue in 2009. Before breaking up in October 1987, the band recorded eight songs that would sit in abandoned storage containers for over 25 years. “Assemblege” collects these multi-track recordings, which were originally made between March 1987 and July 1987. The lineup for this period was James Tabbi (vocals, acoustic guitar), Jeff Gallea (bass, drum programs, vocals, synthesizer), Jack Schaefer (electric guitar), Dan Brumley (sequences, samples, vocoder) and new member Tim Masick (electronic drums). “Assemblage” is a logical progression from “Bas Relief” and will satisfy listeners who were left wanting more. The songs are driven by strong melodic basslines, atmospheric synth washes, and textural guitars. James’ signature new wave vocals sound more British than American, recalling the best of New Order or Depeche Mode. Tim Masick’s drum programs add an electro element to Eleven Pond’s DIY sound. Their primary influences were Joy Division Fad Gadget, and Echo and the Bunnymen, as well another obscure American college rock band, For Against. All songs have been remastered from the original reel to reel tapes for vinyl by George Horn at Fantasy Studios in Berkeley. 25 years later we can finally enjoy this set of songs rescued from obscurity.